My wife and I are in our mid 30’s with a 3-year-old son, and we are travelling Australia full time. We were both working full time and with life’s general commitments we decided we’d had enough of the everyday grind. Once we decided to go, we got organised relatively quickly. 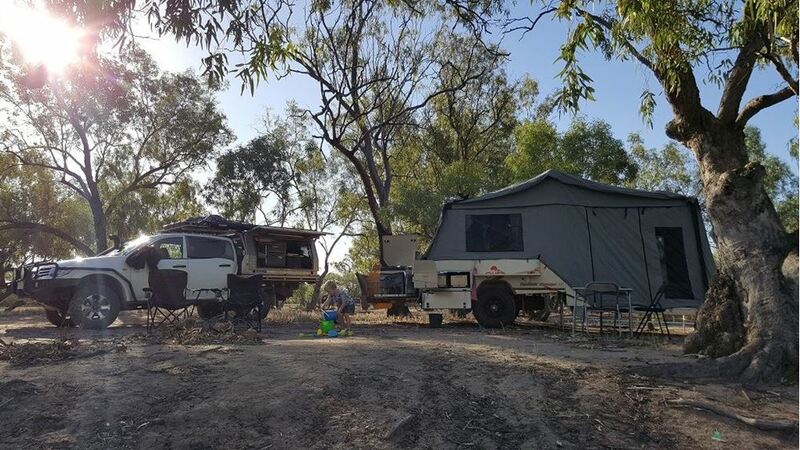 With the house tenanted, our possessions either sold, donated or stored and the remainder packed into our Mitsubishi Triton and a Cub Campers camper trailer, we were ready to go. We work as we travel to fund the trip. We left home January 2016 so have been on the road around 16 months, 12 of those in Queensland alone. As far as power consumers go we have a combination 60L fridge/freezer and some LED lighting in the canopy of the car. The trailer is a little heavier in use. There is a 60L fridge, multiple LED lights inside, a floodlight for outside and a couple of 12V fans. We also use a Pure Sine Wave Inverter to charge the likely culprits such as phones, laptop, camera batteries, 12V shower pump, and a few other odds and ends. With all these items, we aren’t huge power consumers. However, our 12V requirements are still significant and probably in line with a lot of others out there whether you are on the road full time, or just away for a week or two, or even a long weekend. All these items run off of a 100A/hr deep cycle battery in the trailer and a 130A/hr deep cycle battery in the canopy of the ute (both are attached to 240V chargers). When we left home we only had a single regulated 120W portable solar panel. At the start of the trip, we had to stay more frequently in caravan parks to pay for power as the single panel wasn’t enough for our needs. As the trip progressed we wanted to stay longer in places like free camps, farm stays, national parks and beach camps that didn’t have powered options. We could only really do this for a few days at a time as we didn’t have the facility to keep the batteries topped up. Sometimes we would find a magical spot that we would want to stay at for a decent length of time, and not being able to do that was incredibly frustrating. We looked at a few options and decided to install a REDARC 1225D DC-DC charger into the camper for a few reasons. Voltage drop – Being so far from the starter battery it is possible that you may get voltage drop over that distance (although this can, of course, be helped by having large enough cable for the distance). The battery charger will boost charge into your battery while driving while also acting as an isolator so you don’t flatten your starter battery while stopped. 100% charge – The dc to dc charger has a multi-stage charge that allows charging of your battery up to 100%, which is a huge benefit as it means nine times out of ten you are arriving at camp fully charged! Solar Charger – The dual battery charger also has an MPPT solar charger built in so you know you are getting the most out of the panels you have. At the same time that we did this, we moved the 120W panel to the roof rack of the car and also bought a cheap 200W panel off of eBay. We knew the battery charger would help with our goal of being able to camp off the grid longer, but honestly, it has exceeded our expectations. Like I mentioned before we are arriving at camp with the battery in the camper fully charged. So the 200W portable solar panel now just has to keep it topped up, which it does efficiently through the inbuilt charger in the unit. If we have good weather this is generally enough to keep everything ticking over well but if it is a little overcast or cloudy the cheap eBay panel starts to struggle. So we again turned to REDARC. Living on the road, space is often at a premium, and we had always drooled over the prospect of a solar blanket so we decided this would be a good opportunity to invest in one. We didn’t need a heap more power just enough to tip us over the edge, so we chose the 115W Sunpower solar blanket. This little product has been awesome! We regularly use this instead of the 200W folding panel as it’s so much easier to use. It is lighter by a long way and takes up a fraction of the space. It can be thrown over the bonnet or windscreen of the car or even the awning/roof of the camper, or simply laid out on the ground. My wife is particularly impressed with it - she can’t believe it packs so much punch but folds up so small. The combination of these two products has allowed us to achieve what we set out to do; stay longer where we want and when we want without the stress of losing a fridge full of food or damaging our batteries. I couldn’t recommend them both more highly. Want to know more? Why not try our solar calculator to determine the right wattage for your power needs? SUMMIT 2 SEA ADVENTURES DO VAN DIEMANS LAND! What do you do with a DC to DC battery charger?